Previous studies from our laboratory showed that in the anesthetized cat, the intradermal injection of capsaicin in the hindpaw facilitated the intraspinal field potentials (IFPs) evoked by stimulation of the intermediate and high-threshold myelinated fibers in the posterior articular nerve (PAN). The capsaicin-induced facilitation was significantly reduced 3–4 h after the injection, despite the persistence of hindpaw inflammation. Although this effect was attributed to an incremented descending inhibition acting on the spinal pathways, it was not clear if it was set in operation once the capsaicin-induced effects exceeded a certain threshold, or if it was continuously operating to keep the increased neuronal activation within manageable limits. To evaluate the changes in descending inhibition, we now examined the effects of successive reversible spinal blocks on the amplitude of the PAN IFPs evoked at different times after the intradermal injection of capsaicin. 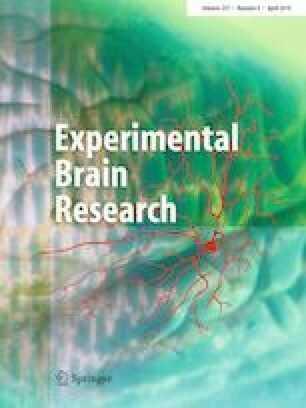 We found that after capsaicin the PAN IFPs recorded in laminae III–V by activation of high-threshold nociceptive Aδ myelinated fibers increased gradually during successive reversible spinal blocks, while the IFPs evoked by intermediate and low threshold proprioceptive Aβ afferents were only slightly affected. It is concluded that during the development of the central sensitization produced by capsaicin, there is a gradual increase of descending inhibition that tends to limit the nociceptive-induced facilitation, mainly by acting on the neuronal populations receiving inputs from the capsaicin-activated afferents without significantly affecting the information on joint angle transmitted by the low threshold afferents. We would like to thank Dr. S. Glusman for his comments to an earlier version of this paper, to C. León for technical assistance and to E. Rosales for her excellent secretarial support. This work was partly supported CONACyT Grants 50900 and 255548. AR was holder of a CONACyT fellowship for doctoral studies.